Getting it in with Queens?? BTN raises a CO limper so I figure he's got a wide range trying to steal, SB (short stack) 3-bets, and I 4 bet enough to put him all in expecting CO and BTN to fold out, but the BTN raises, SB calls,.. What do you do? Is anyone jamming here or just fold expecting to only be up against AA or KK?? fold, fold, CO calls 1 BB, BTN raises to 4 BB, SB raises to 7 BB, Hero raises to 24.5 BB, fold, BTN raises to 78 BB, SB calls 15.9 BB, Hero .....? That's a tough one. I assume BTN has a range of AK, KK+. I don't exactly know how much equity you need to make a breakeven call but I guess it's a fold. I just finished rewatching the pain threshold video with Soto and Berkey in Core. I think your preflop raise is along the lines of what they were discussing. Most of the time V will fold to often against this large of a raise. When V raises, it makes me think that he is doing so with AK KK+. We do not have a lot of information on this individual player so we do not know if he has an exploit where he is wider than AK, KK+. The population at this stake generally will only 5 bet for value. Until we get more information on this player I believe folding is the correct play. if interested here's how the rest of the hand played out, probably much as most expected. I was well ahead of the 3-betting SB (who i was trying to isolate) but BTN had the nuts. I jammed because flatting 80% of my stack didn't make sense to me either, i thought BTN could do this with hands like JJ, AK, maybe even TT. Was the initial 4-bet a good idea? Or should i just be flatting from the BB like this? The flop was connected (but not too scary for a 3bet pot), and I could have maybe found a fold on the turn with A showing up, but really there's no way not to lose some money on average when facing AA and holding QQ, or am i wrong? I'm typically not trying to get 100bb in with QQ pre, and next time i'm in a situation like this i will likely just be flat calling (even tho in this situation BTN would have 4 bet either way). I figured BTN was trying to iso the CO limper wide as BTN often do, but happened to be up against the top of any range. I was OK with getting 23bb in and iso'ing the SB, but those plans changed quick. Reverse your thinking to see if you shall fold or shove. - SB being so short, I'd not consider him for action aka I'd consider your raise as a 3bet and BU's raise as 4bet. - When V raises, he is committing and will always call (odds would be way too good to call with almost anything he re-raise with, except if he was bluff raising with pure napkins, which is pretty rare and can be ruled out). Question is then: what should bet BU's range for us to play for stacks +EV preflop ? Our pot odds is easy to calculate: 75.5bb / 222.9bb = 33.87%. - Could this range be expanded, with more "value" combo QQ beat (like lower PP, strong broadways) or with bluff combos ? (More your can expend V's range, better is your EV). QQ vs range of AKo AKs KK and AA gives ~40% equity. Remove AKo from that range and EQ drops to ~27%. 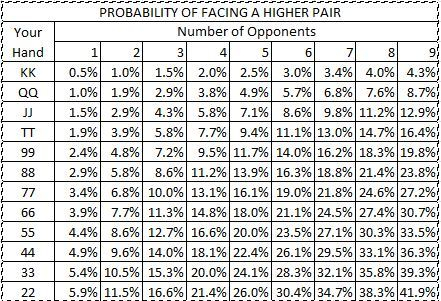 At 6max there is ~6% probability of facing a higher pair when holding QQ (or so i've read). Without a lot of hands on villian its hard to say what range they would do this with, but as mentioned my raise creates a situation where I feel like I just had to jam. I had almost this exact same thing happen tonight to me in 5nl. He had AA to my QQ. All in preflop. Got crushed. It happens. Hard to keep your money when holding a premium against Aces. This was a strange one for me since I had little information (1st hand at the table), and all the action was from button and blinds. I will be flatting this in the future. In this situation BTN would likely be 4-betting either way to get SB stack, and I would likely have been dragged along into the mess either way since the board ended up mostly blanks if i remember correctly. I don't know, he had a 1/221 chance for pocket rockets and a 1/221 chance for pocket Kings. At odds of 2/221 being behind I still might stack. Seems like a flopzilla exercise I'll do later. Pizza you are confusing the odds of being dealt a hand with the odds of an action taken being with that hand. But yes the action definitely changes what likely hands are out there. I think you are right. My issue is with the particular opponent. The guy that beat me was a Lag (possibly a fish?) I just got pt4 and have about 150 hands with him (I know it's a small sample) and his VPIP is at 50%. Would a better play have been to call his 3bet instead of 4betting him? Awesome, thanks. Where did you find this? Discussion Getting it in with Queens? ?